The Iowa MOST team is 2 days into surgeries, and there have been a wide variety of needs: tooth extractions, obturators (when the palate cannot be closed), cleft lip, cleft palate, tubes in ears, and a tonsillectomy. Many kids with cleft lip/palate have ENT (Ears, Nose, Throat) needs. Dr. Tom Novak examines a patient. The team works together closely, assessing our ability to meet each child’s needs. Safety is always the topmost consideration. These doctors, PA’s, nurses, medical residents and students are able to respond to a wide variety of medical needs, and it is a joy when we are able to say “yes” to parent and patients. 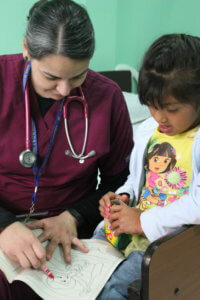 PA Serena Arancibia helps a little girl stay busy in Pre-Op. This year is a pilot year for cataract surgeries and things have been going beautifully, although it’s always a learning process to offer a new procedure. Salus 1, where the cleft and ENT surgeries occur, is not large enough to have both surgical teams work together, so they have been accommodated with a warm welcome at Salus 2, about 8 blocks away. 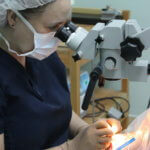 Dr. Kris Mayer performs cataract surgery. Huehuetenango Rotarian and ophthalmologist Dr. Carlos Solorzano was instrumental in helping get the cataract pilot launched, and pre-screened people throughout the year to help identify potential candidates for surgery. Screening day saw around 70 people patiently waiting in the lobby for further screening, and the team expects to complete 25 or 30 surgeries. Dr. John Stamler escorts the patient to his son after surgery. Dr. Kris and Dr. John take a quick rest between surgeries. Iowa City Rotarian Dr. John Stamler worked with SEE International to bring Canadian Dr. Kris Mayer, as well as supplies and equipment, to Huehuetenango. Ginny Stamler is here assisting the team with daily preparation such as assistance with sterilization, and nurses Karyn Spinner and Tanya Hammes have helped make the surgeries possible through their flexible support. 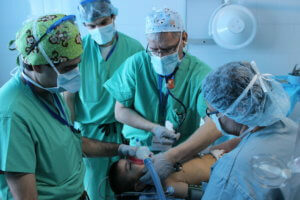 The Anesthesia team helps this boy wake up safely after palate surgery. No matter what the need is, the Iowa MOST team is delighted when we can be of assistance. On its thirteenth mission this year, we have built strong partnerships with local Rotarians and their families, as well as many of the patients and their families who return even when they do not have any medical needs to continue the connection and friendship. 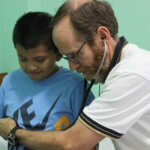 As Medical Team Leader John Canady told the team this year, our business is reconstructing lives.